This supremely useful DC to USB adapter lets you plug in any of your devices that are capable of being charged with a USB cable(such as the Iphone 5 and Samsung Galaxy S4). It has 2 USB ports so that you can connect two devices simultaneously. And it looks great in any interior. This device uses a standard 12V DC found in the majority of cars to provide power to two(2) 5V USB powered devices. This unique USB Extender lets you locate your USB device or hub up to 150 feet from your computer; overcoming the typical 15-foot USB cable limitation. Patented ASIC technology conditions the USB signals to communicate up to 150 feet using low-cost CAT 5/5E/6 cable. Now you can enhance the capability and usefulness of your USB devices. Car chargers come handy when you want to charge your devices on the go. At SF Cable you can find various car chargers to charge your devices. 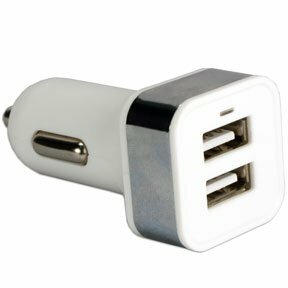 Our range of car chargers include universal laptop car chargers, dual USB car chargers, 2-Port 2.1Amp USB Car Charger for iPod/iPhone/iPad/iPad 2/iPad 3, 2-Port 3.1Amp USB Smart Car Charger for Smartphones and Tablets, 2-Port 2.1Amp USB Car Charger Kit for iPod/iPhone/iPad/iPad 2/iPad 3, and other products. All our products are RoHs certified and doesn't cause any hazard to the environment. Safety and quality are our two ultimate goals along with providing competitive rates to our customers. You can also expect good after sales service and lifetime technical support on all our products.